Why We Do Trips: Shepherd of the Valley’s mission states that, “In community, we discover, grow, and live into our individual relationships with Jesus Christ, by worshipping, learning, connecting, and caring.” Summer Immersion Ministry captures expressions of each of these vital pieces of growing in faith with Jesus; but perhaps the most impactful way Summer Immersion Ministry lives into our mission is by its ability to help participants practice the faith expression of connecting with others. By developing and strengthening relationships in our congregation, local community, and global community through invitation and service, SOTV sends people of all ages into the world to be witness to God’s incredible love. Serve with us, Summer of 2019, to connect with others and experience first-hand the transformational work of the Holy Spirit at work in the world. Camp Wapo sits in between Bear Trap Lake and Lake Wapogasset in Amery, Wisconsin. All campers enjoy unique faith-enriching activities. Completed 9-12 graders get to participate in a separate camp experience specifically tailored to that age group. No matter your age, trust that your week at camp will be an exciting time of deep growth in faith and unforgettable memories. If being at Wapo Main Site during SOTV’s week of camp isn’t your cup of tea, consider visiting camp’s web site for additional camp experiences with specialized focuses. Past options have included Fishing Camp, Horse Camp, and Global Ventures. Camp registration opens online in January 2019. Priority registration ends in mid-March, so please register early! Make all camp payments to Camp WAPO at www.campwapo.org. Summer Stretch is a day camp for middle school youth that incorporates both service and recreation into the mix. Summer Stretch gives youth the chance to stay connected to SOTV over the summer months while developing the skill sets to flourish on overnight service trips. Try the June and/or July sessions to prepare you for the Summer Stretch Capstone in August! While completed 5th graders cannot attend the Summer Stretch Capstone in August, we welcome all completed 5th graders to the June and July sessions of the Summer Stretch day camp, which serve as an awesome bridge into middle school ministry. High School Youth completing grade 10 and up: talk to Zach Rider to be a Summer Stretch leader. 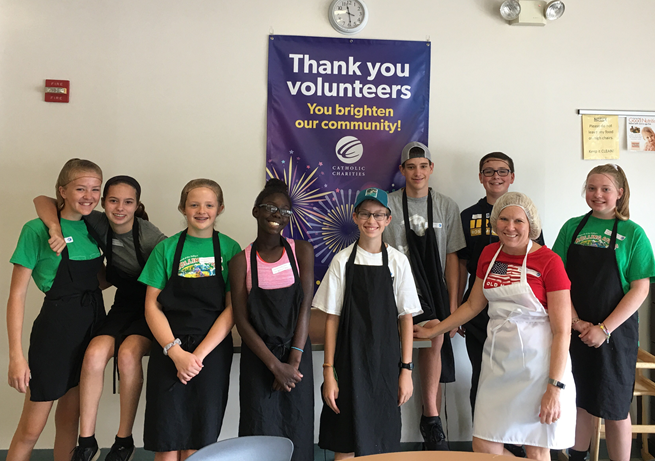 The Summer Stretch Capstone is designed to give completed 6-8 grade youth a taste of overnight service trips. In this half-week trip, youth travel to Shalom Hill Farm. This rural immersion trip will give the chance to spend time in a cabin, participate in service work with gardens and other camp areas, and meet a variety of farm animals. To close out the experience, participants go to Valleyfair for fellowship and fun. Participation in the June and July sessions of Summer Stretch is helpful but not required in order to participate. Summer Stretch Questions: Contact Zach Rider, Youth Director at 952.985.7350 or zach.rider@sotv.org. *Parent Involvement: Parents serving and playing alongside youth has a huge impact on faith formation! Summer Stretch cannot happen without volunteers like you. Please prayerfully consider volunteering for one or all days of Summer Stretch. Contact Zach Rider with questions or to sign-up. *Scholarships Available: There are scholarship forms in the Children, Youth, & Family Office. Please do not let financial reasons prevent you from participating in Summer Stretch. If we reach at least 34 student participants registered for Beach Camp by June 1, everyone signed up for Beach Camp will receive $100 off their registration! Minimum of 34 youth by April 28 for trip to happen. Travel to the beach by coach bus to the Blue Horizon Retreat Center in Panama City, Florida. Mornings and evenings are spent in large and small group worship, Bible Study, and personal faith reflection. In the afternoon participants enjoy the beach and local attractions. Wherever SOTV travels, participants look for good in others, affirm and brighten people’s day, learn and listen to others’ stories, and deepen relational faith skills. Participants intentionally practice the SOTV mission of welcoming, transforming, and sending. Please note that Beach Camp or its equivalent (Disaster Relief) is offered every other year. Minimum of 9 youth, 2 adults by April 28 for trip to happen. April 28: Parent/Participant Summer Trip Night 7:00-8:00 pm for all trips (Camp Wapo, Cheyenne River, Beach Camp, and the Summer Stretch Overnight Capstone). Payment of $100 due (or remaining $75 for the Summer Stretch Overnight Capstone). At the discretion of the SOTV Youth Staff, trips that have not met the minimum number of participants needed will be cancelled. June 1: Remaining Balance Due. June 9: Summer Trip Commissioning Services in the Sanctuary and t-shirt pick-up in the Narthex at 9:45 am and 11:00 am.